Phenibut is commonly used as an effective anti-stress product, and sometimes as a hangover cure. It is known to increase the user’s mood and to promote sociability. It can reduce feelings of pain and promotes a feeling of calmness and well-being. It has also been reported to have some nootropic properties, and a few studies have found that it is capable of providing the heart and brain with extra protection from harmful stresses, such as heat and lack of oxygen. However, due to its potential to cause harm, Phenibut MUST BE USED RESPONSIBLY. We’ve all been there. A big night out and you wake up the next day feeling, well, let’s just say you’ve felt better. A banging headache, trembling, nausea, irritated stomach, as well as feelings of depression and regret maybe some of the presents you wake up to after a night out. There must be as many, if not more, wives-tales and myths about how to cure a hangover as there are drinks to create one. Oily food, sodas, chugging water, raw eggs, hair-of-the-dog – these are just a few of the many “cures” we may have all tried at one point. The truth is, there isn’t really a ‘cure’ for a hangover. Hangovers used to be thought to be directly caused by dehydration because alcohol works as a diuretic. However, scientists have found a large number of other contributory factors that include lack of sleep, acetaldehyde – a byproduct of alcohol metabolism that is far more toxic than alcohol, and possibly even an immune response to the toxins in your body. The best plan is to drink lots of water, avoid more alcohol, eat and get plenty of sleep. Check out our Ultimate Phenibut Guide! Can Phenibut help with a hangover? Yes! 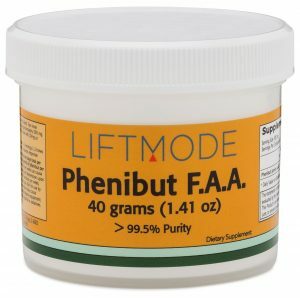 Phenibut’s main effects include reducing stress and promoting a feeling of calmness and serenity. Hangovers often leave you feeling low, depressed, and anxious, and this is exactly where Phenibut comes in. Another important factor is that Phenibut is able to reduce the sensations of pain, by targeting GABA-B receptors. Hangovers frequently involve a headache and aching joints, which Phenibut is able to reduce. In fact, some people use Phenibut entirely for the purpose of relief from headaches. Lastly, a lot of users have reported boosts in brain performance and cognition when taking Phenibut. These are what we call nootropic effects. While a hangover leaves you feeling groggy and fogged up, Phenibut may be able to help clear up the grogginess. The only thing that Phenibut can’t really help with is the stomach irritation that some people get from a hangover. Phenibut and alcohol are both Central Nervous System depressants, and it is strongly recommended to NOT combine the two. Combing Phenibut with alcohol or other depressants such as benzodiazepines can be fatal. Do not take Phenibut before a night out, in the hope that it will cure a hangover the next day. We recommend waiting for at least 8-12hours after your last drink before taking a dose of Phenibut. Remember the liver metabolizes roughly one standard drink per hour, so try to work out how long it will be until your body has cleared the alcohol before taking Phenibut. This is NOT a dietary supplement. Handle with care. Not intended to treat, diagnose, or cure any disease or ailment. Use with CAUTION. When taken inappropriately, Phenibut can cause serious adverse effects. Keep out of reach of children. Please read and fully understand associated risks before using. This product has not been approved by the FDA. Phenibut (â-Phenyl-GABA): A Tranquilizer and Nootropic Drug, Lapin, I. 2001, CNS Drug Reviews, Vol. 7, No. 4, pp. 471–481. GABAb Receptor Pharmacology: A Tribute to Norman Bowery, Academic Press, 21 Sep 2010, p. 25.